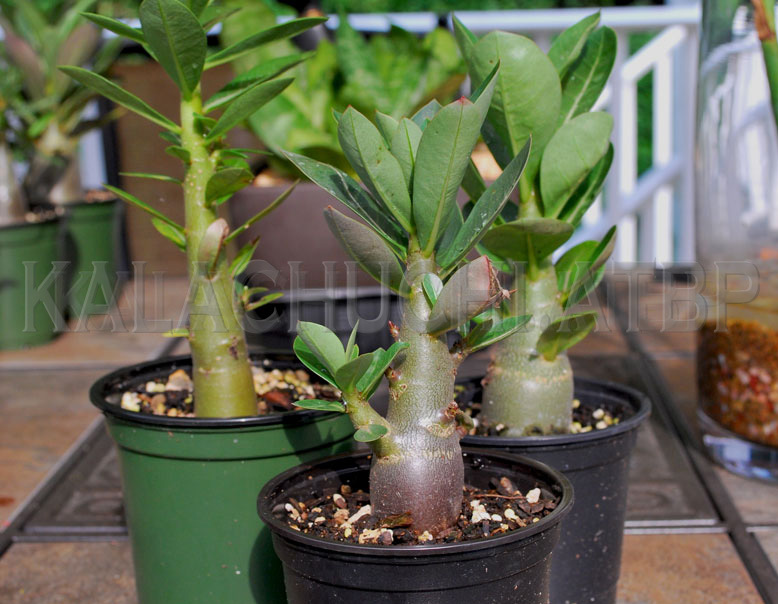 I have zero interest in sowing any more adenium seeds. Those things always turn into plants that I have to shelter in winter and no one I know wants them when I am done experimenting. But then, I somehow ended up with 20 seeds that originated from Mark Dimmit's legendary hands. In case you don't know, Dimmit is to growing adeniums what Steven Brack and Steven Hammer are to growing mesembs. If you do not know any of these guys, then think Henry Gray as in Gray's Anatomy. Together with Gene Joseph and David Palzkill, Dimmit also wrote the book on adeniums called--well-- "Adenium", with a long subtitle. It's ridiculously expensive so I've never read it. But Dimmit has this site which had been my starting point when I first met adeniums. So you can imagine when offered these seeds, you're an idiot to refuse. So here they are, no special treatment, no leaf-holding, plant whispering or any kind of woowoo. Just plain, great seeds. Sown in February, on a heat mat, under T5HOs 14 hours a day. They were fresh seeds so they germinated quickly. 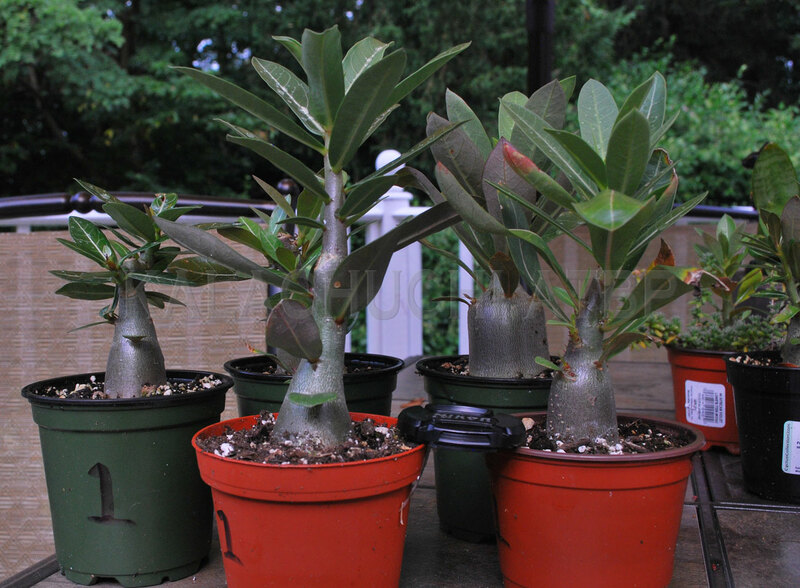 By end of April, the seedlings needed to be repotted individually. 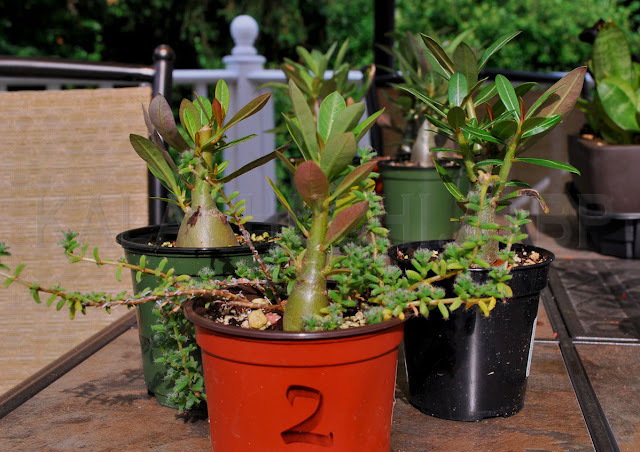 After the imbroglio with putting seedlings in gritty mix (don't do it unless you're prepared to water them twice a day for two months), these were instead planted in a mix of compost, ordinary potting soil and perlite. 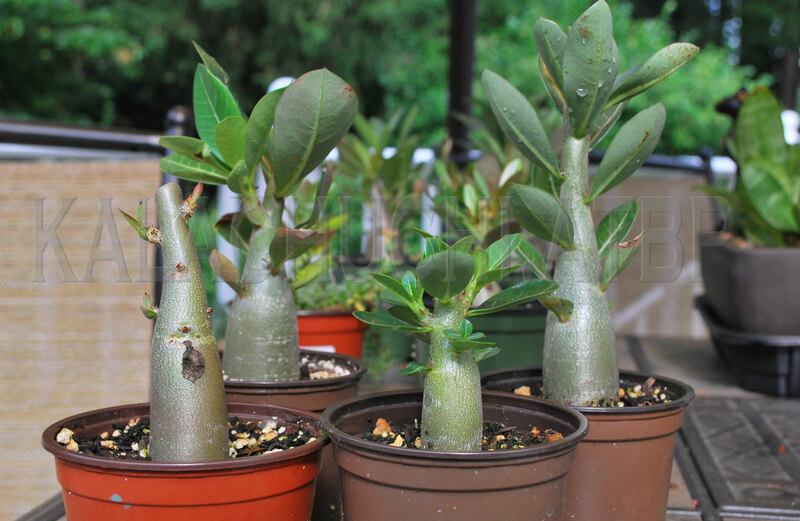 In that medium, they only needed water once a week in early spring and every three two four days in summer. 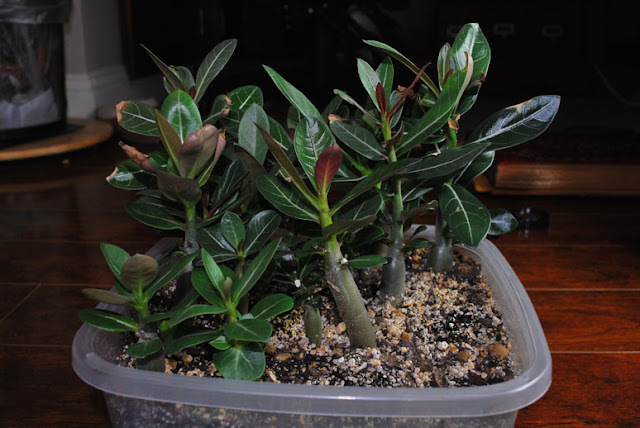 I usually grow adeniums very hard to keep them compact, but these were unusually vigorous seedling--watering needed to keep up. The one on the left is the biggest of the lot, one of the A. arabicum x crispum seedlings. All five have turned dark purplish brown, all with heavy leaves and ever-widening trunks. I do not know what arabicum cultivar Mr. Dimmit used to cross with a crispum but this dark purplish tint of the caudices has only shown up in my Black Pearl arabicums. The A. arabicum x hansoti is the iffiest of these--to start with, only two of them germinated. It's a little hard to predict what they will look like eventually. 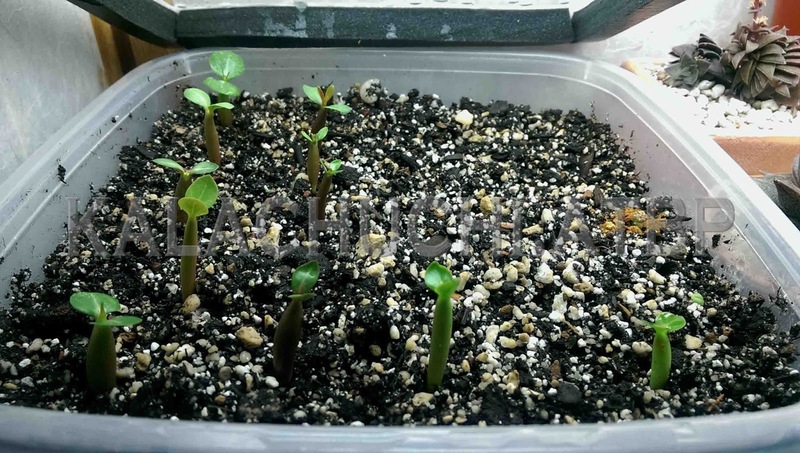 But they had the thinnest mass of roots under the soil too, so it might just have been failure to compete in the crib before they were individually potted up. 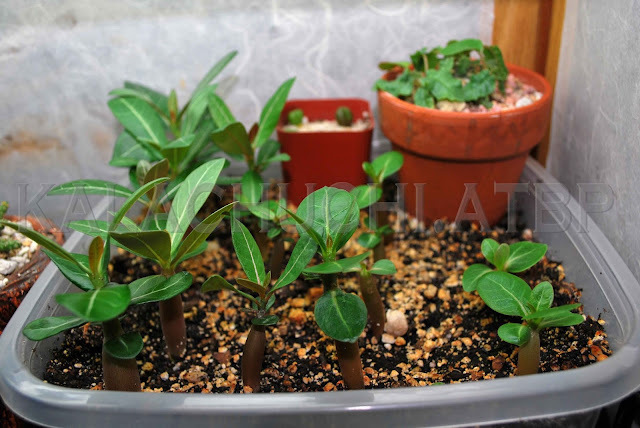 The surprise seedlings, however, were the A. obesum x crispum. The tendency of all four seedlings had been to grow tall and lanky, refusing the branch even after being pruned from the top. They are not at all easy to get into shape, they have so far ended up frumpy no matter how they are pruned. After trimming off the top the second time, I decided to just leave them alone and do what they wanted. I expect these particular strains will continue to grow tall and lanky, with very little branching, if any. But that isn't the surprising part since seedlings less than a year old are generally unruly. 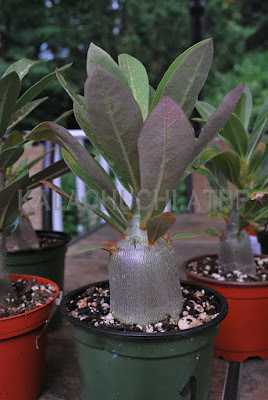 The surprise was how early one of these A. obesum x crispum started developing buds. It is the first and only seed-grown plant on my bench that has ever bloomed. 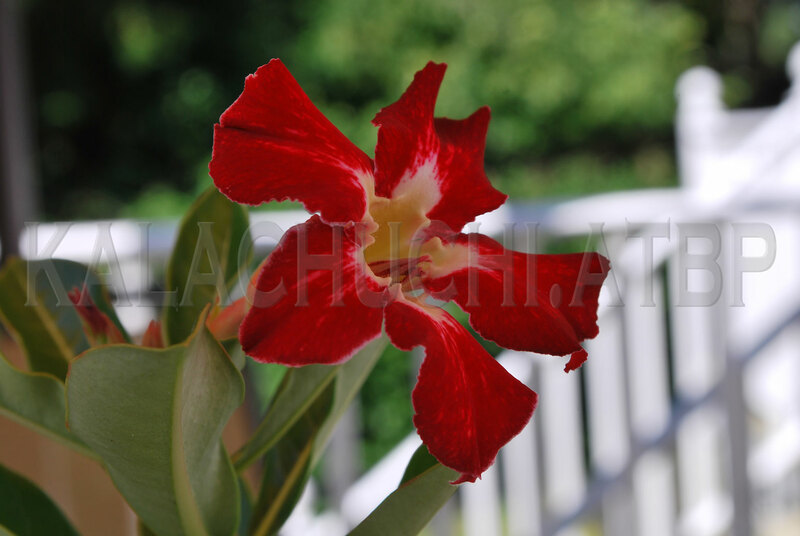 The petals are even deeper red than the Rik Ni Ran, with a thin white outline on the edges and markings along the length. I'm sure there is a name for those marks, I just don't know what it is. The throat is yellow with a colar of white. This flower also has that curliness that crispum flowers have. I don't know what's up with that. Now I want a crispum. (No!) The bottom line is that nothing beats great seeds. They do all the work themselves. Go Dimmit!